Showing results for tags 'SMG'. Hey, just wondering what other people think of the pp-19-01 by LCT. I have one and gotta say, I'm not impressed with it, has a lot of issues with mags not fitting and even the battery compartment being to small to fit the battery in, these aren't things I expected from a £250 AEG. Has anyone else had similar issues with this brand. I meant to make this thread a while ago, back in May to be specific, When i first got this into a semi-working state. But as seems to happen, i got frustrated with it for one reason or another, and put it aside to come back to later. This project has been a long time in coming and has changed completely from the beginning till now. its also the first gbb I've made that doesnt use a single part that i didnt machine, other then the kwc magazine. The original name for this project was the 'Schrott pistole' Or basically scrap pistol, and the idea was to make an airsoft pistol out of bits and pieces i had left from other experiments. It was to look something along the lines of the 'lo-life' pistol from Metro 2034, basically a really crude Mauser 712 style pistol. 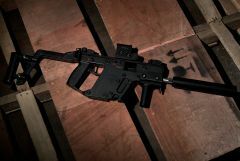 It would be Semi automatic only, though open bolt, so the semi auto functionality was built directly into the trigger engagement, without the need to have a separately actuated disconnector. But the more i worked on it, the bigger it got, and i decided to make it into something more akin to a kg9, along with full auto fire. The originally square receiver was changed to a cylindrical type, and i decided it would be an smg instead, it just made more sense. This is a video from back in may showing how it looked then, though it was missing any sort of barrel so the BB's were just spraying out the end as the loading nozzle pushed them out of the magazine. You can see how it only fires single shots and full auto fire requires causing a deliberate malfunction, basically jamming your finger into the gap next to the trigger so it never resets. originally that was an intended feature. I had been very slowly working on the design but really didnt like it anymore. i had made a really short barrel and hopup unit but it was incredibly prone to jamming in all but the best scenarios, and on top of it, it was hideous looking. I shelved it and worked on some other projects for a few months, Like the WE based OA93 that id been working on at the same time, and shower shells for orion flare guns. Fast forward to early September, Ive finished some of those other projects and i want to work on something else. I figured well heck, ive got this ugly half finished smg to work on, might as well do something with that. I decided that it needed a more standard grip, so the bottom of the receiver was hacksawed off, and modified for the wooden ar style grip i had made for the older ferret smg. It already looked sort of like a sten with the barrel shroud and its open bolt already, so i gave it a safety catch Like a sten or mp40. it needed a stock too, so i made one out of the same oak the pistol grip was made of. It didnt really need it to be compact either since id already made the ferret to be compact, so i figured why not give it a longer barrel? Then i noticed how much it looked like a thompson. So i cut the sides of the receiver flat to go with that look too.Then i figured i might as well make it select fire, because the thompson was that way. This is an issue thats been plaguing me. since it was designed to be semi auto only, i had to basically break it to be full auto, and then add a switch to act as a disconnector. it doesnt quite work right yet, and it has a tendency to force itself into full auto. It literally flips itself into full auto. So Im still working on that. But after all that, if anyone is still reading, here it is. The K-smg2 in its current form, and almost sort of working! though not. i wouldnt take it to a field yet. it reallllllly likes to put itself into full auto. aside from fixing that whole 'it goes into full auto by itself' thing, i also need to actually make sights. the bases are there but theres nothing in them. no apertures or anything. theres also some other parts i want to make, like a vertical forward grip and button disconnect for the stock. maybe even a sliding stock as an alternative to the wood. Its kind of up in the air for now. So Im open to suggestions on how to finish this Sten/thompson *bramston pickle*-child off, aside from actually fixing the obvious flaws.